What if Bradley could help you meet toilet room ADA design requirements; while reducing your clients' toilet room space (SqFt) and construction costs? A Bradley WashBar 3-in-1 handwashing system provides designers with a unique accessibility product solution that delivers a more efficient, compact ADA compliant toilet room. Bradley, the leaders in all-in-one technology, has scaled down the delivery of soap, water and hand drying via the exclusive Verge® with WashBar™ technology. 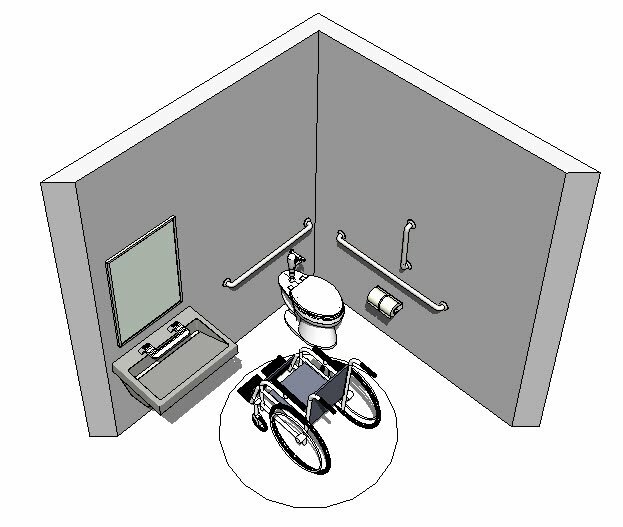 Franchise Client: "We realize the Bradley WashBar could significantly reduce our ADA toilet room spaces. The construction cost savings easily pay for the WashBar; while providing our franchises with the option to reallocate the 'saved space' to retail and\or customer seating space." Bradley centralizes the core handwashing components (water, soap, & dryer) to the wash basin. 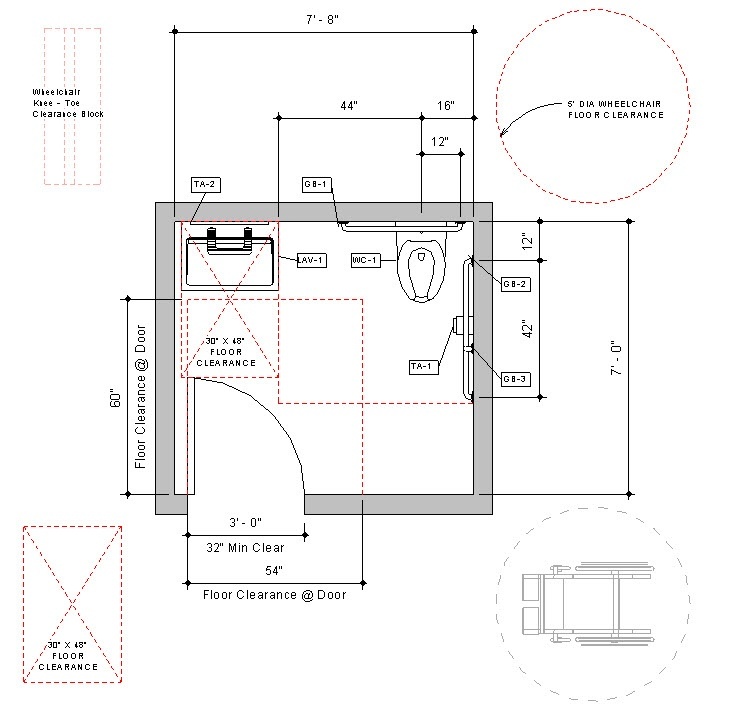 This provides designers with the opportunity to significantly reduce the toilet room footprint or square footage. Reducing toilet room space allowed the franchise to reduce the respective construction costs. The new available space could be allocated to both retail and customer seating space. provide a pretty cool visually-appealing, technologically-savvy handwashing product. The Verge with the patented WashBar Technology provides a completely touchless handwashing experience in a sleek and engaging design. 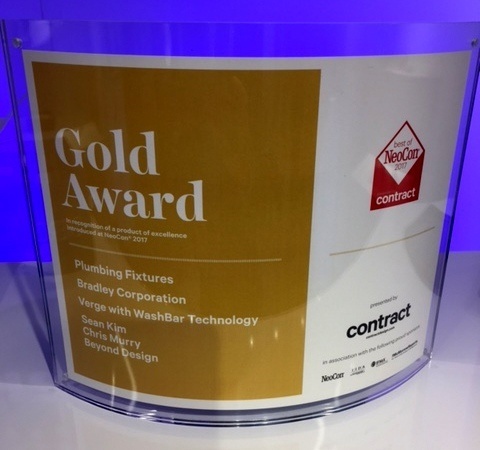 The Bradley Verge® with WashBar™ Technology has received the NeoCon® Gold Award in Recognition of a product of excellence introduced at NeoCon 2017. The Gold Award is the Highest in Category. The winners of the 2017 Best of NeoCon Competition were announced on Monday, June 12, during an awards breakfast hosted by Contract at the Renaissance Hotel in Chicago. Ninety-six awards were distributed in this year’s competition of contract furnishing products, including 10 Innovation Awards and a Best of Competition Award. The 2017 Annual Excellence in Design (EID) recognizes the Bradley Verge with WashBar with its Gold Award. Winning designs were selected by an independent panel of design experts on the basis of creativity, ease of use, and visual appeal. All award winners are profiled in the June 2017 issue of appliance DESIGN magazine. Award winners will also be featured on the website at http://www.appliancedesign.com/eid a permanent section dedicated to the competition. Bradley, the leaders in all-in-one technology, comes the Verge® with exclusive WashBar™ technology. The product recognition of the 2017 NeoCon Gold Award and the 2017 appliance DESIGN Gold Award for the Verge with WashBar Technology is greatly appreciated.